IMG_0149, originally uploaded by jahansell. 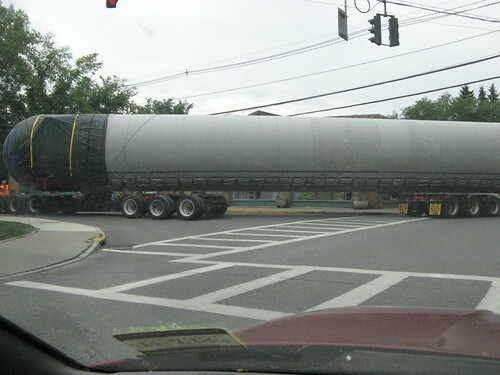 Apparently, this is a fuel tank for a NASA rocket on its way from Hartford to Nebraska (or some such.) Why it had to travel around the tightest intersection in the northeast (and get stuck there for about a half-hour) I'm not sure. Looking at all the pictures of it together (see two more here) I"m reminded of a silly Sesame Street bit. It was called Howard's End, an episode of Monsterpiece Theatre narrated by Alaistair Cookie in a smoking jacket. In some fine English-looking garden, you see a worm (just part of it) and Cookie says, "This is Howard's beginning." Pan to another part of the worm. "This is Howard's middle." and you can guess the rest..."This is Howard's End." Wow, that's a tight corner even in a car! How did it fare at the checkerboard turn? It had to get stuck there because it could!